Where Julie Goes, Music Follows: Showin' Off Them Legs! Random photographs of urban Ottawa. That's how Brant Thompson describes his work. Working under the moniker Random Incident, Thompson's focus is mainly street photography. His images expose the hidden (and sometimes not so hidden) charms of Ottawa, especially Centretown, which is where he lives. "I have my camera on me all the time. As I'm walking around the streets, if I see something interesting, I'll take a picture of it." Thompson was born and raised in Ottawa. A graduate of Algonquin College's photography program, he became interested in photography when he was young. Despite this, he set aside photography until recently. So what prompted his return to photography? "Three years ago, when I got a decent cell phone with a good camera [...] I had a camera on me all the time so I started taking pictures more regularly." He purchased a new camera shortly after that, and he's been enjoying his endeavours in photography since then. Last year, Thompson had an exhibit at the Atomic Rooster called Intersections. Thompson's recent exhibit is now on display at the Ministry of Coffee. It's entitled Best Legs Contest and Other Stories. The show features - you guessed it - legs! But not just any legs - lovely, tattooed legs! "I had taken a picture of someone with tattoos on their legs, and then that evolved into a series of photographs of people with tattoos on their legs," said Thompson. Legs aren't your thing? Don't worry. This show is a series of photographs and topics, which includes street art and more. When Thompson was first curating this exhibit, he had certain photographs in mind. Initially, the exhibition was going to be called Water Under the Bridge and Other Stories. But when he started pulling the photographs for the show, he discovered a huge difference between the images on the screen and the printed photographs. "When I was printing the images, I was discarding half the ones I had chosen. I was thinking to myself 'I have all these great pictures but they're not translating into anything.' So it's funny that the piece of the show that I had mind when I approached the Ministry of Coffee to be the main focus of the exhibition, was the piece that was the hardest to pull together." Thompson also mentioned that the venue was an important consideration when curating the exhibit. "The Ministry of Coffee is a fun, young, hip place so I thought about the people who go there and I wanted this exhibit to be light and fun. It needs to appeal to the crowd that goes there." But, as Thompson mentioned (and the proof is in his images), light and fun can also be beautiful. One of the series of images is Enchanted Garden. It features a vacant lot on Gladstone Street with lots of flowers and weeds, which create a nice contrast with the great graffiti. Another series of images is entitled Water Under the Bridge. Thompson was taking bike rides down the Ottawa river and noticed the interesting graffiti under the bridges. He started documenting the art and things nearby during his bike rides. Another exquisite image is The Last Good Man. Thompson had found a book right beside one of the bridges, with its pages blowing in the wind. The book has been mangled by the weather; it was mouldy. And it just so happened that the title of the book was "The Last Good Man". A stunning image! One of Thompson's favourite images is a picture of an old stone industrial building, with a wall of gray cement with some graffiti on it, an old mill on Victoria Island. One of the images that really stood out for me is called “I Love My Body”. The image features street art currently on display on Elgin Street. According to Thompson, since the street art is the size of a newspaper box, no one has taken it away or removed it. On one side, it says "I Love My Body" and on the other, "Life is Really Beautiful". Thompson's goal is always "finding this object and finding an interesting way of photographing it". These two images are striking and the people walking on the street beside these strong messages make it quite romantic. So what's next for this local photographer? Thompson just started taking photographs of musical performances this past Summer at Glowfair and he's looking forward to doing more of that. Thompson likes attending community events, including Ravenswing. He would love to put together a show of these images. 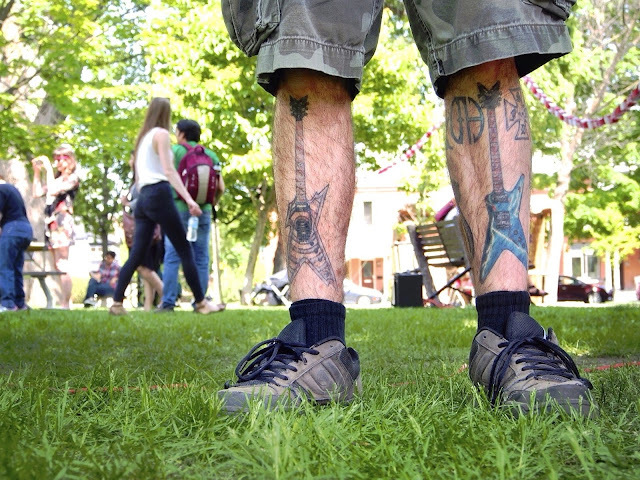 Check out Best Legs Contest and Other Stories at the Ministry of Coffee until September 30. All the prints on display are for sale. You can see Thompson's work here.